Reselect "Body" and make two copies in front (Control + C > Control + F > Control + F) then select the four red shapes and duplicate them (Control + C > Control + F). Select these red copies, turn them into a compound path (Object > Compound Path > Make) and go to Object > Path > Offset Path. Enter a 2px Offset and click OK. Fill the resulting path with black and lower its opacity to 10%. Select it along with one of the two copies of "Body" created in the beginning of the step and click on the Intersect button from the Pathfinder panel. Turn the resulting group of shapes into a compound path (Object > Compound Path > Make). Reselect the red compound path created in the previous step and go again to Object > Path > Offset Path. Enter a 4px Offset and click OK. Fill the resulting path with black and lower its opacity to 10%. Select it along with the other copy of "Body" created in the previous step and click on the Intersect button from the Pathfinder panel. Turn the resulting group of shapes into a compound path (Object > Compound Path > Make). Finally, delete the red compound path and make sure that you keep the four separated red shapes. Let’s add some extra details for the red shapes. Start with the top one. 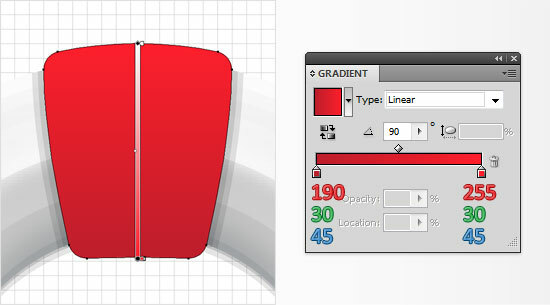 Select it and replace the flat red with the linear gradient shown below. Disable the Snap to Grid (View > Snap to Grid). 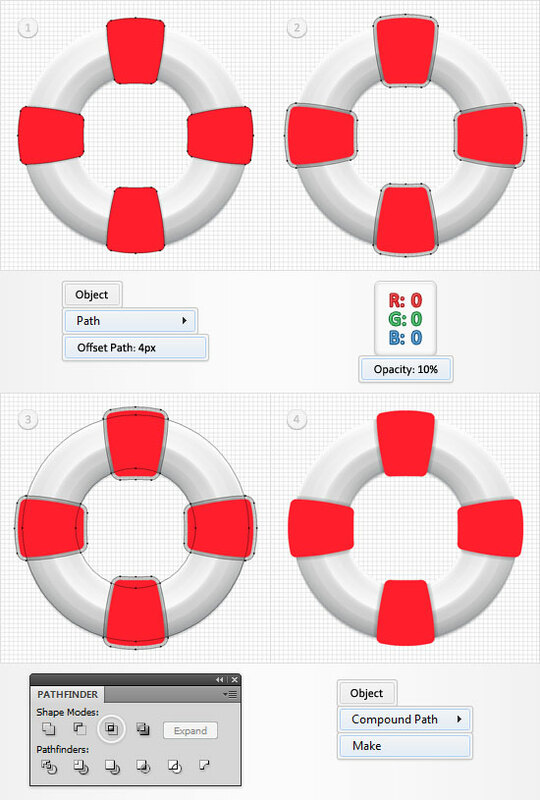 Reselect the red shape edited in the previous step and go to Object > Path > Offset Path. Enter a -2px Offset and click OK. Select the resulting shape, make a copy in front (Control + C > Control + F) and move it 1px down. 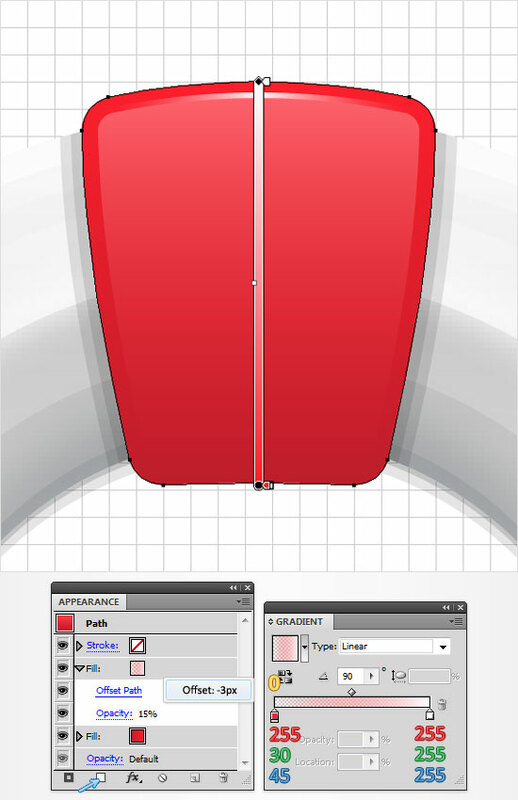 Reselect the two shapes created in this step and click on the Minus Front button from the Pathfinder panel. Fill the resulting shape with the linear gradient shown below. The yellow zeros from the gradient image stand for opacity percentage. 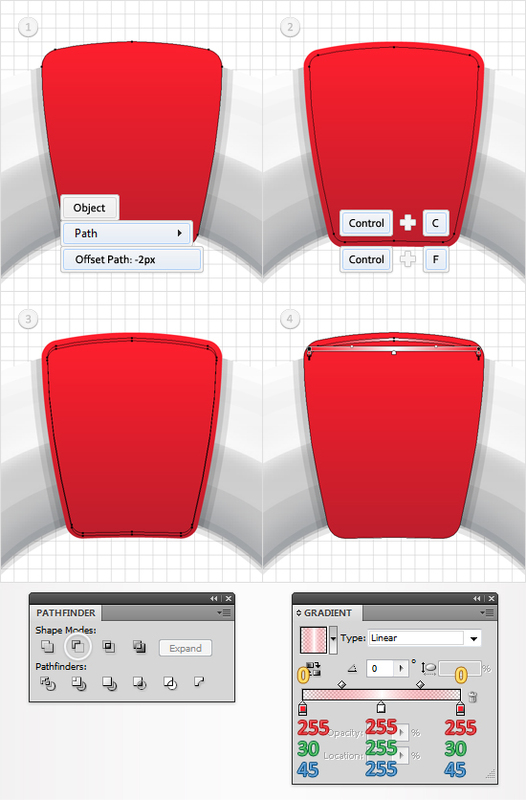 Reselect the top, red shape go to the Appearance panel and add a new fill using the Add New Fill button. It’s the little, white square icon from the bottom of the Appearance panel. Select this new fill from the Appearance panel, lower its opacity to 15%, add the linear gradient shown below and go to Effect > Path > Offset Path. Enter a -3px Offset and click OK.
Focus on the remaining red shapes and repeat the techniques mentioned in the last three steps. Re-enable the Snap to Grid (View > Snap to Grid), pick the Ellipse Tool(L), create a 195px circle and place it as shown in the first image. Fill it with none, add a 15pt stroke (any color) and go to Object > Path > Outline Stroke. Select the resulting path, fill it with the linear gradient shown in the second image, change its blending mode to Overlay and go to Effect > Blur > Gaussian Blur. Enter a 5px radius and click OK. 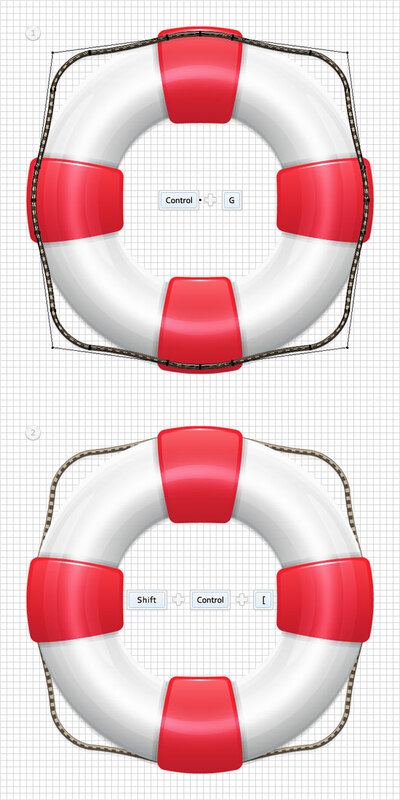 Pick the Ellipse Tool(L) and create two, 10 by 155px shapes. Fill them with the linear gradient shown below and place them as shown in the following image. Select the left shape, lower its opacity to 50%, change the blending mode to Overlay and go to Effect > Warp > Arc. Enter the data shown in the left window and click OK. Select the right shape, lower its opacity to 50%, change the blending mode to Overlay and go to Effect > Warp > Arc. Enter the data shown in the right window and click OK. 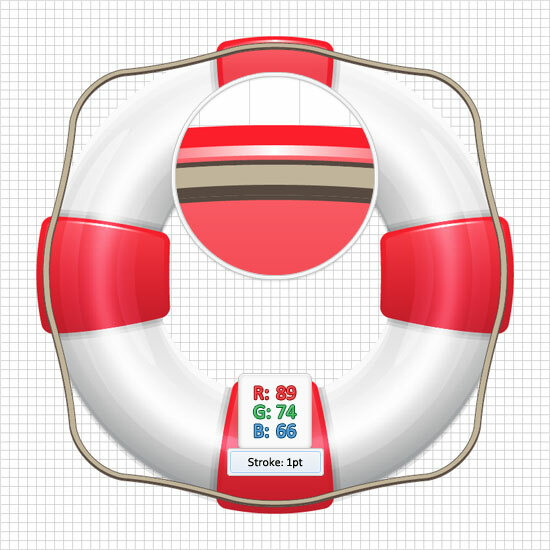 Pick the Ellipse Tool(L) and create two, 10 by 95px shapes. Fill them with the linear gradient shown below and place them as shown in the following image. Select the left shape, lower its opacity to 40%, change the blending mode to Overlay and go to Effect > Warp > Arc. Enter the data shown in the left window and click OK. Select the right shape, lower its opacity to 40%, change the blending mode to Overlay and go to Effect > Warp > Arc. Enter the data shown in the right window and click OK. Pick the Ellipse Tool(L) and create two, 95by 10px shapes. Fill them with the linear gradient shown below and place them as shown in the following image. Select the top shape, lower its opacity to 40%, change the blending mode to Overlay and go to Effect > Warp > Arc. Enter the data shown in the left window and click OK. Select the bottom shape, lower its opacity to 40%, change the blending mode to Overlay and go to Effect > Warp > Arc. Enter the data shown in the right window and click OK. 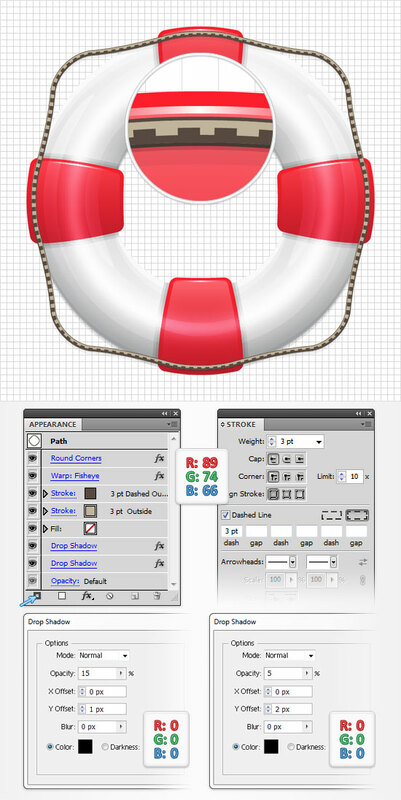 Pick the Ellipse Tool(L), create a 195px circle and place it as shown in the first image. Fill it with none but add a 3pt stroke. Make it white, lower its opacity to 30% and go to Effect > Blur > Gaussian Blur. Enter a 3px radius and click OK. 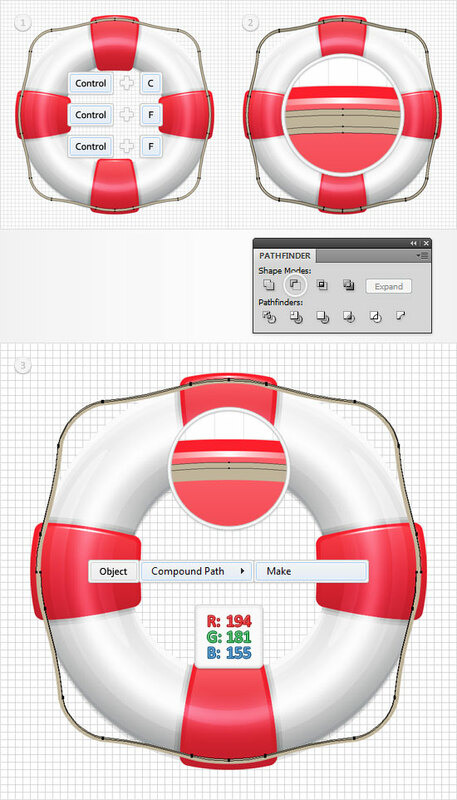 Pick the Rectangle Tool(M), create a 255px square and place it as shown in the first image. Fill it with none but add a 3pt stroke. Set its color at R=194 G=181 B=155, align it to the outside and go to Object > Path > Add Anchor Points. Make sure that this rectangle is still selected and switch to the Direct Selection Tool(A). Select the top, left anchor point and drag it 15px down and to the right then select the top, right anchor point and drag it 15px down and to the left. 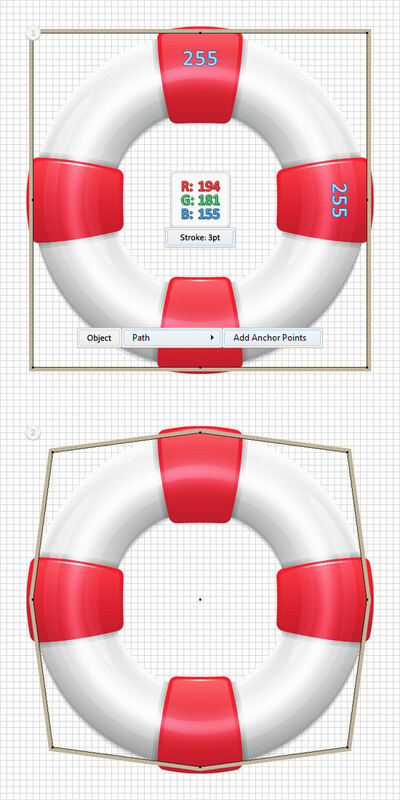 Move down, select the bottom, left anchor point and drag it 15px up and to the right then select the bottom, right anchor point and drag it 15px up and to the left. In the end your shape should look like in the second image. 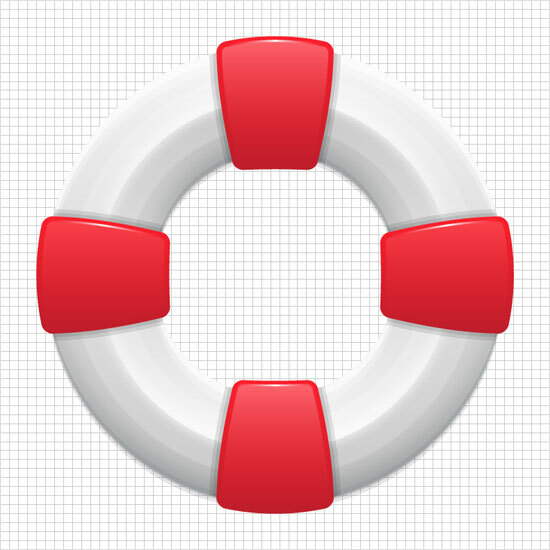 Reselect the shape created in the previous step and go to Effect > Stylize > Rounded Corners. 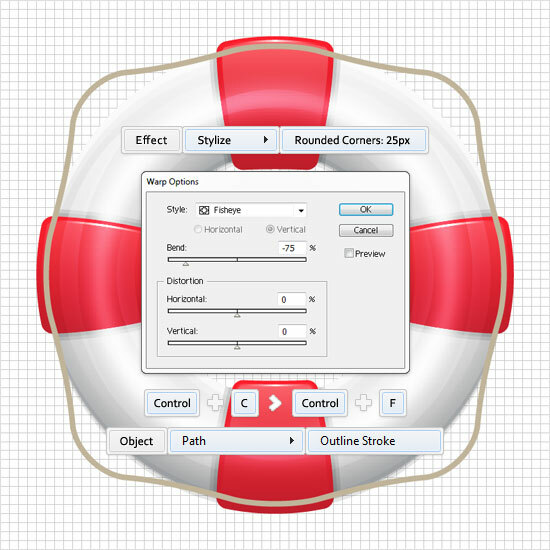 Enter a 25px radius, click OK and go to Effect > Warp > Fisheye. Enter the data shown below and click OK. In the end it should look like in the following image. Make a copy in front (Control + C > Control + F), select it and go to Object > Path > Outline Stroke. Disable the Snap to Grid (View > Snap to Grid). Select the path created in the end of the previous step and make two copies in front (Control + C > Control + F > Control + F). Select the top copy and move it 1px down. Reselect both copies and click on the Minus Front from the Pathfinder panel. Turn the resulting group of shapes into a compound path and make sure that it’s filled with R=194 G=181 B=155. 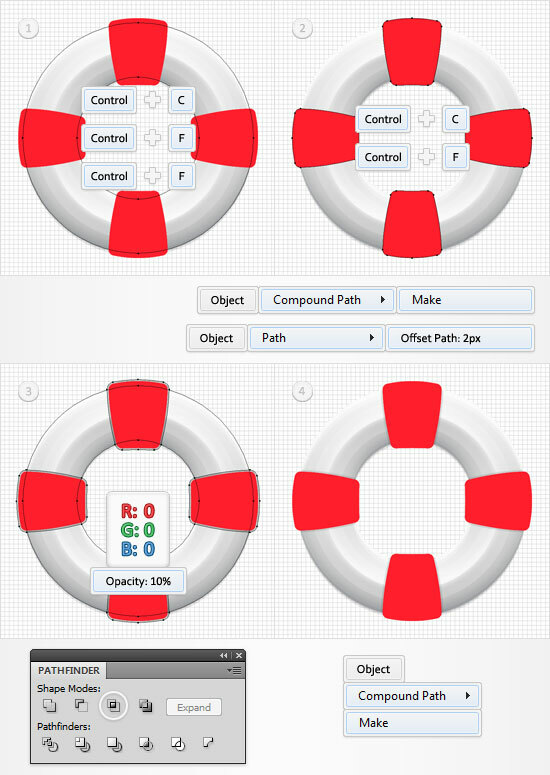 Reselect the path created at the end of the step 30 and make two copies in front (Control + C > Control + F > Control + F). Select the top copy and move it 1px up. Reselect both copies and click on Minus Front from the Pathfinder panel. Turn the resulting group of shapes into a compound path and fill it with R=89 G=74 B=66. Reselect the path created at the end of the thirtieth step, remove the color from the fill and add a 1pt stroke. Set its color at R=99 G=74 B=66. Reselect the path edited in step 30 (the one with the stroke), and drag it above the path edited in the previous step (in the Layers panel). 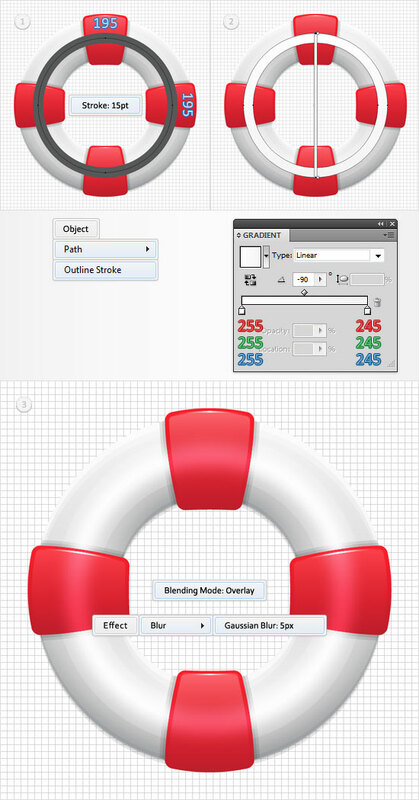 With this path still selected, focus on the Appearance panel and add a second stroke using the Add New Stroke button. It’s the little, black square icon from the bottom, left corner of the Appearance panel. 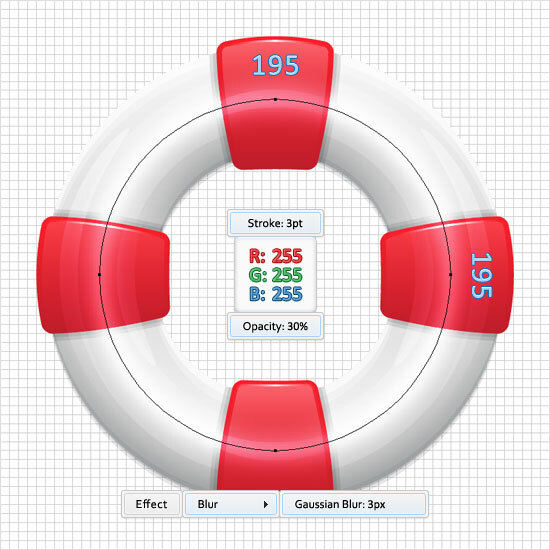 Select this new stroke, make it 3pt wide, align it to the outside, set its color at R=89 G=74 B=66 and open the Stroke panel. Check the Dashed Line box and enter 3pt in the dash line. Reselect this path, make sure that no fill or stroke is selected (in the Appearance panel) and go to Effect > Stylize > Drop Shadow. Enter the data shown in the left window, click OK then go again to Effect > Stylize > Drop Shadow. Enter the data shown in the right window and click OK. Select all the shapes created in the last six steps, group them (Control + G) and send the group to back (Shift + Control + [ ). That wraps up the tutorial. Thanks for following it through to the end. Once again, here is what the final result should look. We would love to hear your thoughts on this new Adobe Illustrator tutorial. Feel free to hit us up in the comment section with your comments or questions.